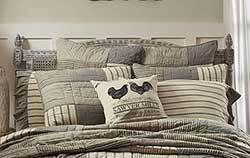 Features a distressed farmhouse word and grainsack stripes in denim blue on muslin bleached white material. Features a distressed farmhouse lamb print in denim windmill on Muslin bleached white material. The Sawyer Mill Charcoal Block Quilted Throw offers a unique country look to set the Farmhouse style mood. 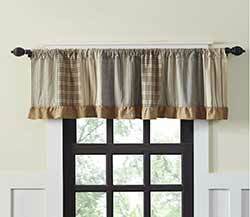 Bring a Farmhouse mood to your window with the Sawyer Mill Charcoal Short Panel Set with attached Valance. 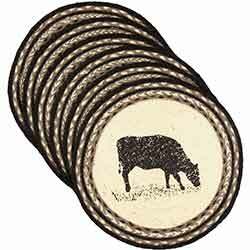 The Sawyer Mill Placemat Set is a tasteful Farmhouse addition to your home. 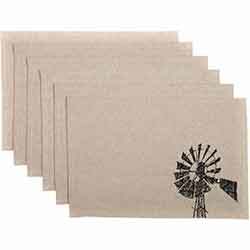 The Sawyer Mill Windmill Placemat Set is a unique take on Farmhouse with its black windmill vane over a cotton textured khaki chambray base. 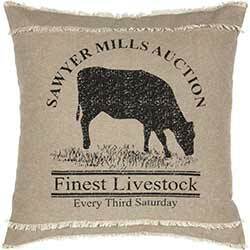 For a vintage prairie inspired look, this decorative pillow features a cow-themed black stenciled image khaki chambray. Relax in a farmhouse style bedroom with the Sawyer Mill Collection, featuring plaid and striped fabrics in ash grey, black, and creme. This is for the fabric Euro Sham. Relax in a farmhouse style bedroom with the Sawyer Mill Collection, featuring plaid and striped fabrics in ash grey, black, and creme. 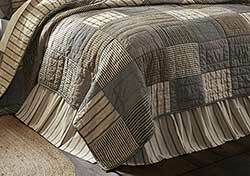 This is for the quilted Euro Sham. Relax in a farmhouse style bedroom with the Sawyer Mill Collection, featuring plaid and striped fabrics in ash grey, black, and creme. 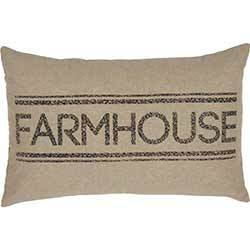 This is for the Farmhouse Decorative Pillow. Relax in a farmhouse style bedroom with the Sawyer Mill Collection, featuring plaid and striped fabrics in ash grey, black, and creme. This is for the King sized Bed Skirt. 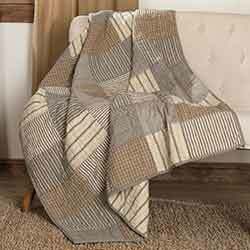 Relax in a farmhouse style bedroom with this simple block patchwork quilt, featuring plaid and striped fabrics in ash grey, black, and creme. This is for the King size quilt. Relax in a farmhouse style bedroom with this simple block patchwork quilt, featuring plaid and striped fabrics in ash grey, black, and creme. This is for the Luxury King size quilt. Relax in a farmhouse style bedroom with the Sawyer Mill Collection, featuring plaid and striped fabrics in ash grey, black, and creme. 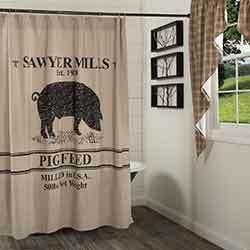 This is for the quilted Sawyer Mill Luxury Sham. 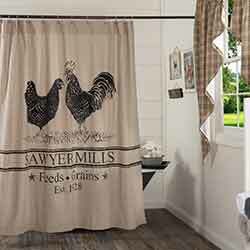 Bring a fresh farmhouse look to your windows with the Sawyer Mill collection. This is for the 72 inch Patchwork Valance. 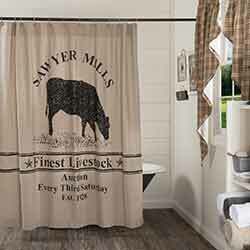 Bring a fresh farmhouse look to your windows with the Sawyer Mill collection. 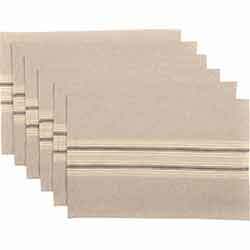 This is for the 90 inch Patchwork Valance. 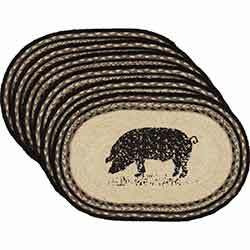 The Sawyer Mill Pig Jute Placemat Set is a true from farm to table addition to your home. 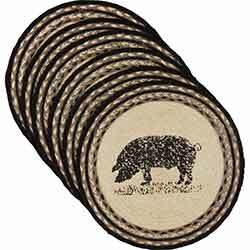 The Sawyer Mill Pig Jute Round Placemat Set is a true from farm to table addition to your home. 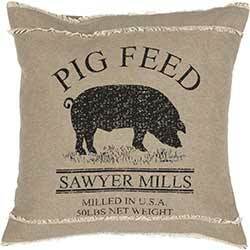 For a vintage prairie inspired look, this decorative pillow features a pig-themed black stenciled image khaki chambray. Relax in a farmhouse style bedroom with the Sawyer Mill Collection, featuring plaid and striped fabrics in ash grey, black, and creme. This is for the st of two pillow cases. 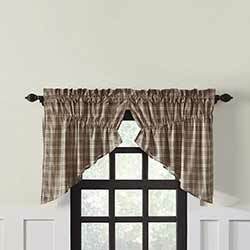 Dress up your window with this farmhouse inspired valance, featuring a large scale black plaid pattern against a tan background. This is for the 60 inch Plaid Valance. 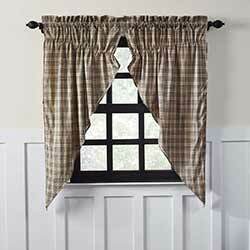 Dress up your window with this farmhouse inspired valance, featuring a large scale black plaid pattern against a tan background. This is for the 72 inch Plaid Valance. 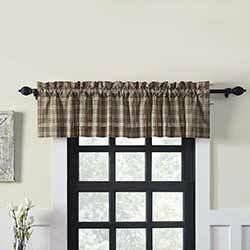 Dress up your window with this farmhouse inspired valance, featuring a large scale black plaid pattern against a tan background. This is for the 90 inch Plaid Valance. 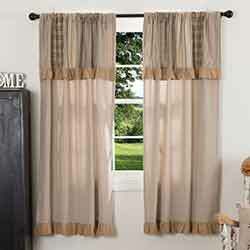 Bring a fresh farmhouse look to your windows with the Sawyer Mill collection. Features a large-scale black plaid against a tan background. This is for the Prairie Curtain. 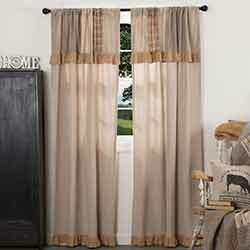 Bring a fresh farmhouse look to your windows with the Sawyer Mill collection. Features a large-scale black plaid against a tan background. 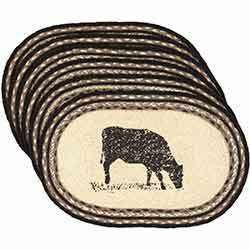 This is for the Prairie Swag. Relax in a farmhouse style bedroom with the Sawyer Mill Collection, featuring plaid and striped fabrics in ash grey, black, and creme. This is for the Queen sized Bed Skirt.